Sauropods are a subgroup of the saurischian, or "lizard-hipped," dinosaurs. This group of quadrupedal (four-legged), herbivorous animals had a relatively simple body plan which varied only slightly throughout the group. Early relatives of the sauropods, the Late Triassic plateosaurs or prosauropods, may have occasionally stood on their hind legs. True sauropods, such as Diplodocus shown here, appeared in the Late Triassic and began to diversify in the Middle Jurassic, about 180 million years ago. They had very long necks and tails, relatively small skulls and brains, and erect limbs reminiscent of the limbs of elephants. The nostrils of these animals were located high up on the skulls, rather than being located at the end of the snout like those of so many other terrestrial vertebrates. In fact, in some examples these nostril openings were so far up the skull that they were very close to the eye openings. Still another unusual feature which appeared in some of the later sauropods was rudimentary body armor. 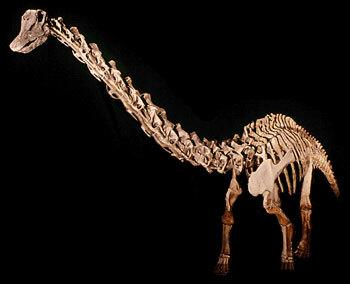 Find out more about the sauropod diet.